The art of film going cannot be killed for the simple reason it cannot be replaced. 3D LED displays will not replace it, nor will the world's most comfortable couch. Mobile won't replace it either, cause I don't know about you but I don't really want to watch a movie on a screen the size of a triscuit. What cannot be replaced, what is crucial is, of course, community. The sense something extraordinary is occurring and is shared amongst a group of strangers. This will never be duplicated by advances in technology. It cannot be duplicated in the home theater, no matter how state-of-the-art, nor should it be. The community I pay tribute to here is the that of the Cinephile. Ironically, things have never been better for the movie obsessive. Availability of titles, even the most obscure, thanks to the likes of Netflix, Criterion, streaming video and burn on demand are enough the keep the Cinephile shut in for the rest of their lives. But the true Cinephile can never be satisfied with this solitary experience. If you want to make a movie nut happy, put him in a room engaged in filmic discourse with like-minded zealots. It is possible that what the abundance of titles will result in is the increase of movie clubs and boutique cinemas that cater to the movie obsessive. Certainly the astonishing number of (really excellent) Blogs devoted to the art of cinema indicate that the Cinehphile community is truly inexhaustible. When traveling, I found myself being drawn to film going, owing to a lifelong predilection towards the cinema, in opposition to the more reputable touristic activities. These experiences made me feel there was hope for the survival of film exhibition, something about feeling part of a larger community. It is easy to get depressed about the dwindling theaters in one's own city, but when one gets away from your borders, hope is renewed. It occurred to me also that while there are many travel guides that send you on the beaten path towards "must sees," there is very little guidance out there for the Wandering Cinephile. It is in this spirit I have created this Blog. This is a site to help guide you on your travels if your preference while in Amsterdam, for instance, is the geared towards the Tuchinkski rather the Rijksmuseum, for example. Rather than simply offering the facts you need (while careful not to ignore them! ), I have tried with my own contributions and those of contributors to the site to give the site a slightly personal slant, making this more Travelogue than Travel Guide. I have tried to note the points of interest for film fans within the neighborhoods of the cinemas mentioned, to make it easier to plan a point of destination for the day or evening out. My main contribution here is for Paris, the City of Light, more aptly, the City of Cinema. The Seventh Art was born here in the inspirations of the Lumiere Brothers, and that light continues to shine as brightly, perhaps, as anywhere in the world. I hope I have managed to capture that light in the Paris chapters, to the left. So please use the site when planning your cinematic holiday. Visit the links under Chapters, on the left side of the Blog. Use the links, embedded in the chapters, to find out more about the cinemas referenced, particularly regarding their current programming. I hope to keep growing this over time, ideally with more and more contributions from the world's Cinephiles. The number of cinemas may be shrinking, but the number of film nuts is not. 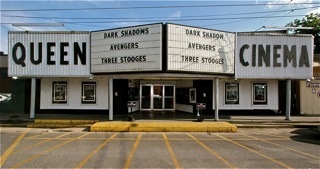 And, please, please please, please contribute to the little cinemas, the old and broken down, the barely hanging on. No matter where you may wander. Anyone who doubts the salience of community to the film going experience needed to be in my first/second grade classroom the day before the holiday break. We invited the class next door to come over and watch Toy Story 3 with us. Now, with the ubiquity of DVD's, I guarantee every kid in that room had already seen that movie. But they were going to sit in rows in chairs with 30 of their friends, and they were excited. I'm not saying you would have necessarily enjoyed being in that room. It reminded me of the experience of going to a movie in Cairo, with the vendors crawling up and down the aisles, as at a baseball game, and people shouting at the screen, or watching Platoon in Sydney, where the testosterone-influenced audience broke into group cheers whenever the characters shot them some Viet Cong (missing, I felt, the intellectual anti-war message, but appreciating the inadvertent but far more potent visceral one). They gaily parroted lines to each other, debated the relative goodness/badness of Lotsa Hugs, the strawberry-scented Stalin character, and couldn't stop themselves telling me what was coming next, though I stopped up my ears dramatically. Along the way they absorbed lessons on narrative, story-telling, and the moral content of loyalty and civil disobedience. There is a grave responsibility to filmmaking, and I'm glad Pixar takes it seriously. Great stuff. Your anecdotes about these rowdy incidents make me wonder if Cinephiles should lighten up and seek out this sort of communal experience more often. We are so snooty about utter silence in the Cinemah. In a way, it sort of belies the whole point of the communal cinematic experience if you try to cocoon yourself in the theater. Time and a place for everything, I suppose.